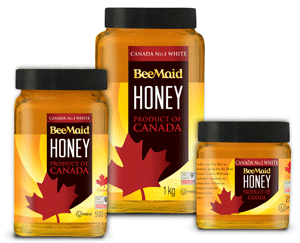 Bee Maid honey offers a wide variety of shapes and sizes of PETE bottles using our in-house blow moulding facility. Our food safety program is always top-of-mind: packing plants are HACCP recognized and we are the first Canadian honey packer to achieve the Safe Quality Food designation. All our products are kosher certified. In addition, Bee Maid Honey is True Source Certified?, which means all our honey is ethically and transparently sourced.